I am very passionate about going to Israel and leading others on tours of the Holy Land. Over 40 times I've lead groups of people in exploring where Jesus walked during His earthly ministry. A colleague once asked me a series of questions below that will help you understand the reasons behind my passion and hopefully encourage you to join us on this year's exciting tour. Will going to Israel impact your life? I have no doubt about it! It will impact your life, because as I always say, traveling around Israel brings the Bible to life. There was a pilgrim who went to Israel around about 1350 A.D. He wrote in his journal, "I have toured the Holy Land, and I can say beyond a shadow of a doubt that a tour of the Holy Land is like reading a fifth gospel, because it brings it all alive in your heart." Take Capernaum for instance, the home town of Peter and headquarters of Jesus during His earthly ministry. After you return home and read about Capernaum from a page in the Bible, it's no longer a name on a page. It has become a place where you walked, you saw it, you smelled it, you felt it, you experience it. I just love to see the Bible come alive for people we have taken over there! How does traveling all over the land of Israel teach about Bible prophecy? The number one reason I believe we're living in the season of the Lord's return has to be the re-establishment of the nation of Israel. The Bible says over and over and over that in the end times the Jewish people are going to be regathered from the four corners of the earth and their nation will be reestablished. They'll be put back in the city of Jerusalem and the whole world will come against them over one issue — the control of Jerusalem. And, that's where we are in history. The world witnessed Israel becoming a nation again in 1948. Of course, I was only a youngster at that time so it was of no significance to me, but when it became significant to me was in 1967. I began to really study Bible prophecy and begin to see prophecy after prophecy being fulfilled before my very eyes that had been written more than 2,000 years ago. End time Bible prophecy focuses on the nation of Israel. It is God's prophetic time-clock. God says when these things start happening Jesus is going to be at the very gates of Heaven. That's why the very beginning of our tour starts in Tel Aviv at the Hall of Independence. Let me just say, the Hall of Independence is one of the most moving places where I take people in Israel. There are a number of places that are moving, but that one is particularly special. Most groups that go to Israel never go there and they completely bypass Tel Aviv, but to go to that place where Bible prophecy was literally fulfilled, where David Ben-Gurion stood up and spoke those words reestablishing the nation of Israel, touches me every time. There are so many prophecies about the recreation of the Israeli state in the end times, but the one that I love the most because it's symbolic (and I love the symbolism) is in Isaiah 66:7. "Before she travailed she brought forth," talks about a pregnant woman giving birth. It continues, "before the birth pains came she gives birth. Before her pain came upon her she gave birth to a boy. Who has heard of such a thing? Who has seen such things? Can a land be born in one day? Can a nation be brought forth all at once?" That's exactly what happened on May 14, 1948 — the nation of Israel was born. The next day the labor pains began with the war of 1948-49, the War of Independence, the Suez War of 1956, the Six-Day War of 1967, the Yom Kippur War of 1973, the Lebanese War of 1982, the Gulf War of 1991, the Arab Intifada from 2000-2004, the Hezbollah War and the Gaza Conflict. It's just war after war after war. The birth pains continue. That's why our tour begins in Tel Aviv at the Hall of Independence, for we learn how Israel becoming a nation once again is in direct fulfillment of Bible prophecy. As we continue throughout the land, I try to give people a survey of the life of Christ. We see places where Jesus walked that have not just only seen their fulfillment of First Coming prophecies, but will see the near fulfillment of Second Coming prophecies as well. What's it like traveling to the Mount of Olives? One thing about the Mount of Olives is that when you stand there and you look out over the city of Jerusalem, if you have any sense of the Bible whatsoever, you will sense that you are standing at the center of the world. Ezekiel said Jerusalem is the center of the earth. Jerusalem is where Jesus spilled His blood. Jerusalem is where He is returning. When I look out there I can see something that had a tremendous impact on my life — the Eastern Gate. In 1967 during the Six-Day War, I was following the news very closely. I was a professor of International Politics at that time. One day I read in the paper where the Israelis had broken into the Old City through the Lion's Gate and had won back the city. They had recaptured it for the first time in 1,897 years. I also read in that article how the Israeli army had originally proposed to blow open the Eastern Gate because they felt like that tactic would catch the Jordanians by surprise. But, an orthodox Jew had said to the affect, "You will do that over my dead body, because that gate is not to be opened until the Messiah returns." I didn't know what he was talking about. At that time I had never been taught Bible Prophecy. So, in 1967, I went to a concordance and I looked up the word "gate." To my astonishment, in Ezekiel 44 there's a statement where Ezekiel is taken on a tour and he basically says, "This gate — the Eastern Gate — will be closed and it will not be opened until the Messiah returns." I wanted to know the history of the Eastern Gate, and so discovered that when the walls were rebuilt in the 1500s, that gate of all the eight gates of Jerusalem was closed. It was bricked up and nobody knows for sure why. But, the rumor and legend is that as the Turks were rebuilding the Old City walls a rumor swept the city that the Messiah was coming. Suleiman the Magnificent called in the rabbis and asked, "Who is this Messiah?" The rabbis replied something like, "The Messiah is going to come and run you out of town, and He's coming through the Eastern Gate." In response, Suleiman ordered his builders to brick up that gate and put a Muslim cemetery in front of it. He believed that no Jewish holy man would ever step into a Muslim cemetery, so the Messiah would never walk through the Eastern Gate." And I thought, "This is incredible!" So, every time I go to Israel and I go to the Mount of Olives I look down at the Eastern Gate. I think there is Bible prophecy fulfilled — right before my very eyes! The Bible said that gate would be closed and it was closed. The Bible says it will not be open until Jesus returns. Many times people have tried to open it and every time they've been stopped. But, one day the Eastern Gate will be opened by Jesus the Messiah at His Second Coming. 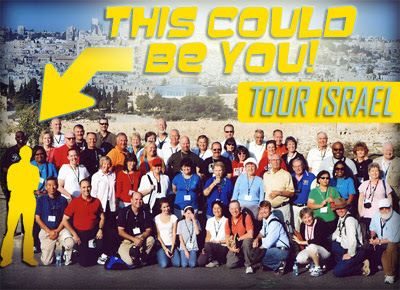 So come, join us on a tour of Israel this November and share in the passion for God's living word! Israeli Defense Minister Ehud Barak stated Wednesday he is in favor of a unilateral Israeli handover of Samaria and Judea to the Palestinian Arabs if the “peace process” remains stalled. This is from the Jerusalem Newswire. So, my question is how would you tour Israel if most of the country is in the hands of the Palestinians? I am beyond myself as to how as Israeli leader can think like this. It is the same spirit which cause Dyan to give back the temple mount. I personally think that anyone in the government of Israel who thinks like this should be shown the door no matter what the individuals past contributions have been. Obviously, Barak does not understand what God has said about dividing Israel. This man is the defense minister and he needs to think about defending the land that is now in Israel's control rather than handing parts of it away. Otherwise, there will be no reason to attempt to see Israel in one's lifetime as I said before: there will be nothing to see. Don't forget that in politics one often says something one doesn't mean to appear cooperative. Israeli leadership knows Israel cannot survive if they hand over all their strategic lands, and prophetically Israel will only grow in land. I agree with Dr. Reagan said that when Jesus return and will open the East Gate. No body could be open because the East Gate has tight until We honored Him to enter the gate. Amen! What has Israel to fear? Are they not confident? Is their military not mighty? Surely if Israel relinguishes more strategic territory they can rest in their diplomacy and the strength of their military for security! Why would Israel need to consider their ways as they continue to profane the name of the Lord God in dividing the inheritance of Jacob for political gain? Surely they will never risk losing the support of evangelicals who continue to praise the leadership of Israel even while they forcibly remove their Jewish citizens from Jewish land and demolish their homes to appease their enemies! Storm clouds are gathering and we all can see them appearing on the horizon carried by a mighty wind! This fierce storm is being gathered by the hand of the Lord God against the Land of Israel in the presence of a people that are confident and rest in the security of their military and their leadership! A rebellious nation that considers the Covenant established with Abraham, Isaac, and Jacob as of no consequence. It will be however, that the Lord God will no longer allow his Holy Name being profaned and will cause his people Israel to know that security without God will result in shame and great sorrow!